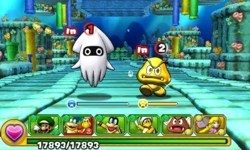 World 2-4 is the fourth course of World 2 in Puzzle & Dragons: Super Mario Bros. Edition. 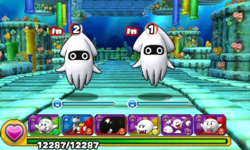 It is a basic, underwater level with enemies consisting of Bloopers and Cheep Cheeps. This level is straightforward, starting with a battle, then a ? Block, another battle, another ? Block, then another battle before the boss fight at the end with a Big Cheep Cheep. A Gold Goomba in ★World 2-4. ★World 2-4 is a difficult version of World 2-4 from ★World 2. The player now has all Orb types on the Orb field. Gold Goombas can appear, but very rarely. This page was last edited on August 13, 2017, at 19:45.